Weight loss plateaus happen. They have happened to me and they will happen to you. Believe me, if there was a way that I could ensure that the little tracking line in my weight loss app was one smooth consecutive downward line, I would be doing that but that’s just not how weight loss works in the real world. When the calories you burn equal the calories you eat, you reach a plateau. To lose more weight, you need to either increase your physical activity or decrease the calories you eat. Using the same approach that worked initially may maintain your weight loss, but it won’t lead to more weight loss. This is absolutely terrible advice and should not be followed. Weight loss is not a Calorie In/Calorie Out proposition and all eating less and exercising more will do is make you hungry. Weight loss is primarily about your hormones and the most important hormone is your insulin which is your “fat storage” hormone. If you decrease the amount of insulin your pancreas has to secrete, you lose weight over the long run. It’s this one simple truth that has enabled me to lose 150 lbs over the last few years and 50 lbs so far this year. 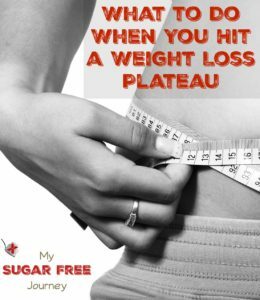 So let’s take a look at some simple action steps you can take to fight through when you hit a plateau. Seriously, take a deep breath. I totally know how it feels to see the numbers on the scale begin to inch back up and wonder if you are about to undo all the hard work you’ve put in to your health. That’s not going to happen. Stick with the program, keep eating real food, make sure to avoid carbs like sugars, grains and starches and relax. It will come, I promise. One thing that was very helpful to me in the beginning especially was to plan out what I was going to eat the next day in a little notebook. I could visualize my meals and take the necessary steps to make sure I had access to the healthy food I needed the next day. Sometimes that required me to make meals in advance, sometimes I had to run to the store to get the food I needed, sometimes I looked at my plan and realized I was planning on eating the wrong foods. It was incredibly helpful to see that information on paper beforehand. Then, once the day was over, I looked back at the plan and assessed what I actually did. Did I eat a snack that wasn’t on the plan? Did I cheat? Why? Answering these questions day by day gave me a better understanding of my cravings and how to deal with them. In the early days of cutting the carbs out of your diet, you are going to lose a lot of water. As you burn through the glycogen stores in your muscles, your body also releases the water the glycogen was stored in. It’s not uncommon to double your trips to the bathroom in those early days so be sure you are replenishing your water as you go. Also, the bowels and kidneys are 2 of 4 ways your body expels toxins and excess fat, (The other 2 are through the skin and exhalation) and water is a key component to making sure that process happens quickly and efficiently. This one step probably did more for my sanity when I hit a plateau more than anything else I did. Once I planned my meals out, I then went back and wrote down what I actually ate, then I weighed myself at the same time every morning. So every time I hit a plateau or even gained a little weight, I was able to go back and track down what caused the issue. It was doing this that caused me to realize that I was far more sensitive to corn than I ever thought possible. It didn’t matter if I eat corn on the cob or had a corn tortilla, if I had corn in any form I was done losing weight for a few days. I can guarantee you that your body reacts differently to different foods. You may have issues with dairy, eggs, soy, gluten, nuts, or who knows what else and not know it because it’s not a debilitating reaction and the only way to discover it is to go in for a battery of tests at the doctor or start tracking your food and weight in one place. You won’t have to do it forever, just until you discover the issue. Exercise is a terrible way to lose weight and you shouldn’t rely on exercise as your main means to shed a few pounds. However having said that, exercise has a lot of other benefits that aren’t directly related to weight loss like increasing your insulin sensitivity and improving your mood. Change things up but be careful to avoid injuries. Concentrate on compound exercises that exercise large groups of muscles at once like squats or bench presses. If you don’t have access to a gym, do the squats without weight, burpees, or just go for a walk but do something. Cortisol is your body’s stress hormone and is great in short bursts like when you are being attacked by a lion but most of us are under constant stress so we have large amounts of cortisol and adrenaline rolling around in our bodies at all times. Unfortunately, cortisol not only drives weight gain by triggering cravings but it also tells our body to store that weight in the worst possible place, right near the midsection. So do something to lower your stress level. Perhaps thats a walk in the sunshine, or a few deep breaths, or meditation or yoga. The point is to do something to get that stress out of your system and get back to the business of losing weight. 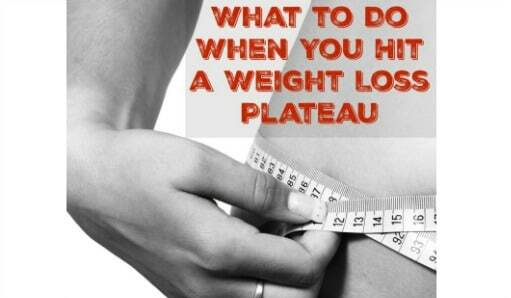 I hope you found these simple steps to follow to get out of a weight loss plateau helpful to you. If so, please share it with your friends! PREVIOUS POST Previous post: 7/6 Weightloss Wednesday: The Holidays Strike Again! NEXT POST Next post: Welcome Vinnie Tortorich Listeners! Want to know something funny? At the top of this page, there is an ad for the Mayo Clinic Diet! Very good advice. I know people who lost a lot of weight and when they plateau, they just give up and put the weight back on! It is so crazy!! I’m so glad I found this and your other sites!! Thanks!! This is great, Aarn! Your advice is solid – and that can be hard to find in the nutrition world. Keep up the good work, and let me know if there’s anything I can do to help you or your readers. That’s great! My 88 year old MIL is on it and she has gotten off a lot of her medications. Let me know if you need any help!